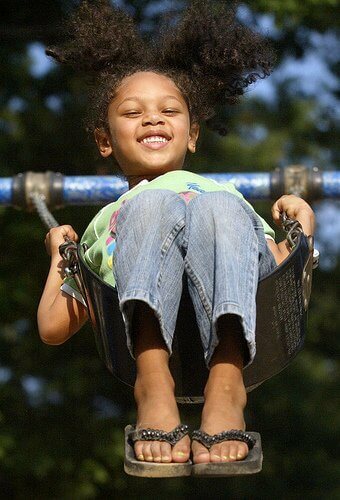 You are here: Home » Blog » Homemaking » Getting Your Kids Outside And Having Fun, Too! Getting Your Kids Outside And Having Fun, Too! If you reside in a cooler climate, you probably can enjoy being outdoors all day long. But I live in the middle of Oklahoma, where temperatures frequently are miserable, and it can even be dangerous to play outside in the middle of the day. For that reason, my kids primarily play outdoors in the early morning and then again after dinner. And because their outdoor playtime is limited to just a few hours a day, I want to make the most of that time. My kids are all little, and I know it is really important for little ones to be developing their motor skills in preparation for school. I also believe it is so important for kids to learn simplicity in their play. Toys have become so high tech and over stimulating, and I really try to help my kids to play the “old fashioned” way using only their imaginations and nature. I don’t regularly schedule a ton of outdoor activities because my children seem content on just playing make believe games or chase with each other. I think that needs to be encouraged. But when the kids are getting bored or we all just need a change of pace, that’s when I pull out my list of fun outdoor activities. While I doubt any of these games or activities will be earth-shattering revelations to you, I want to share just a few of our family favorites with you. Play that involves large body movement will help your child develop their gross motor skills. Riding bikes, hopping, skipping, playing hop scotch—these are all great for your kids’ bodies. 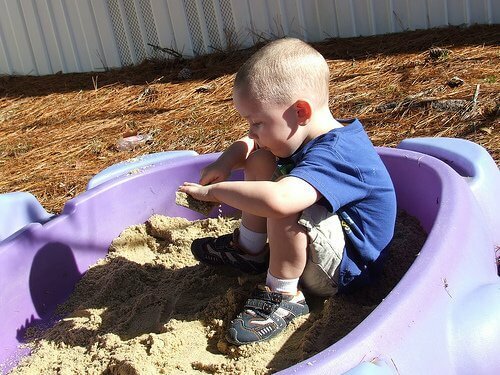 Most outdoor play is in some way involving the gross motor skills. A favorite game with my kids is “Letter Hide and Seek.” I played a game very similar to this growing up, but I have changed it just a bit. I’m currently working on teaching my little ones the letters of the alphabet and the sounds they make. I have 6 children, so I assign a letter to 6 different trees or objects, and then we also assign a home base. (For example, the oak tree is the letter A, and the wheelbarrow is letter B, etc.) One child is “it” and the others hide behind the lettered objects. The child that is “it” calls out a letter and the sound it makes, and if there is a child behind that object, that child becomes the next “it” person unless they can make it to home base without first being tagged. This is a great activity because they are getting a lot of energy out with the running, and they are also learning. You could easily adapt this activity for reviewing older children by assigning the trees names of planets in the solar system, elements in the periodic table, etc. Actions that require more delicate control of smaller muscle groups will help with fine motor skills. Playing in the sandbox, digging in the dirt, picking up bugs (perhaps to your dismay, but we collect them around here! ), and stacking rocks are all fun ways to develop these skills. Outside, one way I try to help with fine motor skills is to have the kids help me pick berries. It takes just the right combination of firmness yet gentleness to get a berry off the tree without squeezing all the juice out. My kids really enjoy helping me with that, although my two and three year olds still get covered in juice. Even if you don’t have berries in your yard, kids love to help with picking flowers or veggies from the garden, or digging for worms in the soil. One of the favorites at our home—especially with my girls—is making flower necklaces. The kids like to pick wildflowers (I really mean weeds) and then sew them together. Sometimes they use string for their creations, but often I will find that they have used sticks to poke holes through the flowers and then used long grass blades as the thread. They are pretty neat! Helping your children develop their ocular motor skills will help them to focus on objects better, and will ultimately lead to a better ability to read. There are so many things to see and focus on outdoors! Think of all that could be seen with a magnifying glass in your backyard! One evening, I was with my kids in the backyard when my oldest daughter started to yell, “Look Momma, there’s an elephant!” I was very confused because she seemed to be looking in our backyard. Then my son chimed in that he, too, saw the elephant. Turns out that the elephant they were seeing was really a cloud shaped like an elephant. But this got me thinking about how little time we take to actually lay back and watch the shapes in the clouds. So, I’ve tried to be more intentional about that. The evening or early morning is a great time for this because the sun will not be dangerously blinding during those times. Since that day, we have seen ships, whales, bugs, and cars—all floating over our house! Now it’s your turn! I’d love to hear about outdoor activities that work well for your family. What do you do to develop important motor skills? Get our latest posts, right to your inbox. 9 Ways Young Kids Can Help (and Even Save You Time) in the Kitchen! Natural help for teething babies? How to Help Your Kids Kick the Screen Habit With a "No Screen Month"
My boys love to catch bugs! It does drive me a wee bit crazy, but I know they just need to be boys, and now your article encourages me even more, it good for their development too! We play “Dodge Ball” (I have a 4 and 2 year old). Basically it involves me running around and chasing them with a ball as they try to “Dodge” it. No sides or anything. Good exercise for me too! We live in the deep south, do you have any tips on how to avoid mosquitoes? I keep them in most of the time because I do not want to be putting repellent all the time. I would love to get them outside twice a day as you have mentioned (It’s super hot and humid down here too), but the mosquitoes are just relentless. .-= Kris´s last blog ..Boiled Corn pp117 =-. @Kris, You could try the Graham Gardens Bug Bar. I haven’t tried it myself, but it looks promising. .-= Ambre´s last blog ..Why This Blog =-. Love the Letter Hide and Seek idea.. Super.. My toddler and I love playing on the swings and slides and the Cloud Watching is a favorite activity with us, since we live in a high-rise apartment and on days when the weather doesn’t let us go down to the park, the balcony lets us indulge in this pastime.. Thanks for sharing these ideas. .-= Prerna´s last blog ..7 Baby Products You May Not Need for Your Baby =-. I completely understand the issues of climate and children playing outside. We live in the Texas Panhandle. June was miserably unseasonably hot. Thank God that “average” temperatures have returned and my kids are loving the opportunities to play outside more. .-= Amy´s last blog ..Bring Back My Bar =-.